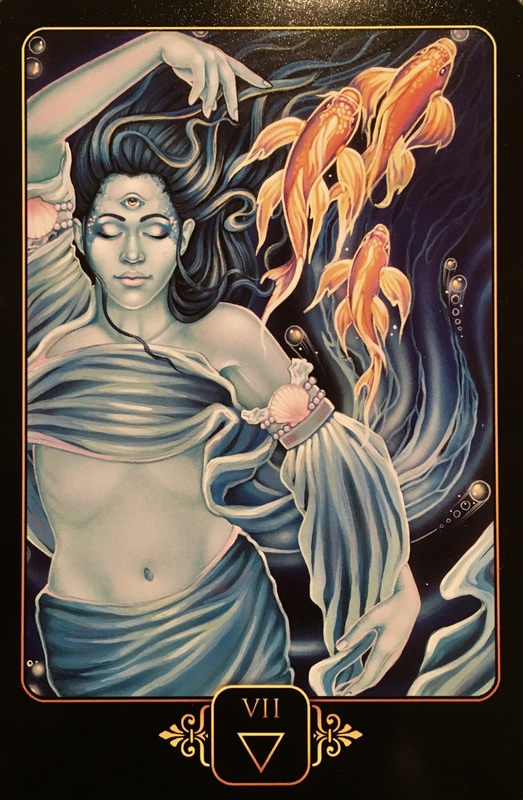 Card Meaning: “The Seven Of Water represents letting go and surrendering to the flow of life, and doing so with complete trust and faith. She is about relinquishing control over all relationships and outcomes, and believing that whatever unfolds in the future is what is meant to be. She has worked diligently in the present, imbuing all she does with her love, so as to create a future that will bring what she needs – to learn, heal, and grow. Now, content and satisfied, because she knows she has done everything she can, she lays back to rest, allowing herself to flow to the next moment and task. The need to control others, or a situation, is born of fear. Whether that fear is about losing someone or something we love, of being alone, or is simply a fear of failure or missing out, we do what we can do to maintain the illusion that we have control. But control is only an illusion, even if we would like to believe otherwise. We can make empowered choices, and work with due diligence and dedication. We can create with the purest of intentions, and be motivated by love, but the outcomes we desire will also be influenced by timing, circumstances, and other people – both those close to us and those of whom we had no knowledge. Because of this, we can have only a partial influence, and the rest is up to fate. If we try to exert more influence and control, we risk sabotaging our hopes and desires, and manifesting an outcome that is vastly different to the one desired. How do you hold on to water? The future is not fixed; it is fluid and shifting and so vast with infinite possibilities that it cannot be contained. Detach emotionally, let go of all expectations, and have faith. Don’t invest in speculation, what ifs, maybes, worry or fear. Potential Blockage: “When The Seven Of Water appears as challenger, she signifies an inability or unwillingness to yield and be flexible. But remember, that which does not bend will eventually break. It is better to achieve your goals by being fluid. Water can find any crack, any opening, and use it to its advantage. If contained, it becomes still and peaceful, calm and waiting. Receptive. Yes, external forces can make waves and ripples, but when the force is removed, stillness and calm are quickly restored. Release the water from its container, and it will follow the path of least resistance, flowing around, over, or underneath any obstacle in its path and overcoming with natural ease and grace. Again we are being asked to step back, be in the natural flow of life, and not to push forward at this time. There is no way to hasten the crop, only to tend to it. Nurture your dreams with positive thoughts, visions, intentions and affirmations. Be patient; rest and relax, knowing that what is yours is coming to you now. Slow down and enjoy the sensory pleasures of life: music, food, good company, nature, solitude. Breathe deeply. Find as many things and people in your life as you can to be grateful for. Life is good and it is about to get better. Know this deep in your heart. Keep your vibration high to meet with the best reality possible. Use your intuition to guide you on. Surround yourself with positive, loving and supportive people. Turn off your tv, take a break from technology and get present. See the abundance all around you, and hold space in your heart for more. I’m so glad my friend Betsy told me about you, because I have enjoyed your posts so much. I’m so pleased, and inspired myself, to hear that you are taking care of your self, to honor the vast, intricate & ever-changing beauty of your stellar soul! I thank you and wish you all the best as your work and life evolves. I’m sorry to hear that someone enjoying your exquisite FREE posts would be so hurtful like that, yet glad if it helped stir positove change I guess….I wish for more kindness the world over, starting with us, to our selves . In first place I am so sorry to hear that you are not well, I wish you the best and that you get better soon. I am also vey sorry to learn that you are shutting down the blog, because, besides the fact that you are weary, some people who literly miss the point, were desagreable. Every day the aut 8am sharp i waited for the card of the day. Sofor all this thankyou. Regarding the donation, I am so sorry that I never made one, but I am insolvent and have no credit cards, and dont know how I can make a donation. So if you have any ideas I would like to know. For all the inspiration and personal growth I gained thank you. Thank you Dee for your incredible love and light and wonderful daily guidance over the years. Your posts have made a huge difference for me. I wish you all the best on your journeys in life. Be ever so kind to yourself.